Last night was build your own burrito night for us so Kidlet gets leftovers for lunch. Of course I had to add one of our favorite sayings from The Nerdist! Kidlet has a burrito with cheese letters, bell peppers with dressing, grapes, checkered apple, and pretzels. oooo now I want a burrito! Great lunch and layout of the photo...I love how the apple pattern is repeated in your background design! 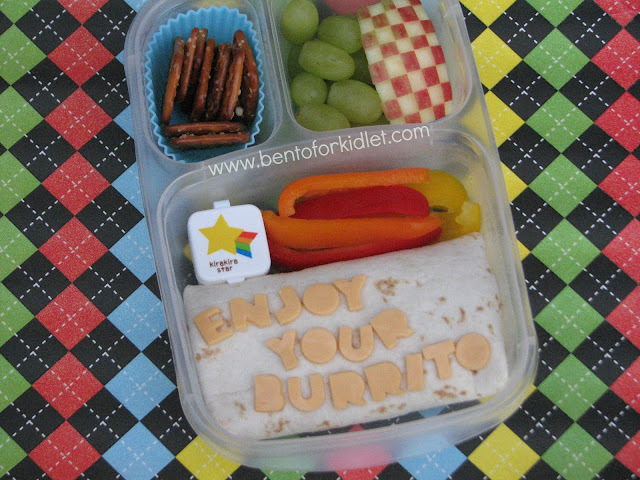 Maybe a quote from The Nerdist, but this bento is totally cool! Will you be my mom? I mean it ...Really.... Dr. Who bentos, IT crowd, all the greats! You are a Nerdy kid's (or Nerdy Grown up's0 dream mom!